Plenty of cooks have prepared racks of lamb, but few have indulged in succulent racks of pork. The latter, quite reasonably priced, make an impressive presentation for entertaining. In the following recipe, a plump rack of pork with 6 ribs is brushed with curry oil (a simple combo of olive oil and curry powder) and then roasted along with red onion wedges. When done, the rack has a rich dark golden hue, and the onions are browned around the edges. A glorious apple chutney, which can be prepared 3 days ahead, makes a stellar accompaniment, with its sweet, tart and hot accents. This roast needs only an hour or slightly more of unattended time in the oven. Once it comes out, simply let it rest a few minutes before carving it into extra large chops. Creamy mashed potatoes and tender green beans sprinkled with sea salt, or roasted butternut squash drizzled with honey and some wild rice would make delectable sides. In a small bowl, whisk together oil and curry powder, and brush all surfaces of rack with half of this mixture. Let rack marinate at cool room temperature for 1 1/2 hours. Arrange a rack at center position and preheat oven to 350 F. Peel onions and cut into 1-inch thick wedges, leaving root ends intact. Salt and pepper rack on all sides. Place a large, heavy flameproof roasting pan over medium-high heat. When hot, add the rack, fat side down, and brown on all sides, 4 to 5 minutes. Stand the rack up and surround with onions. Toss onions with remaining curry oil. Roast pork until a thermometer inserted into the thickest part registers 150 F and onions are softened and browned around the edges, about 60 to 70 minutes. Remove pork to a serving platter and garnish with onions. Cover loosely with foil and let rest 20 minutes. 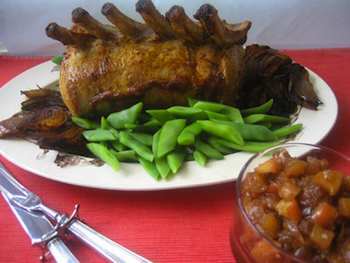 Slice the rack into chops (which will be extra large), sprinkle each with salt, and top with Apple Chutney. Garnish each serving with a few onions. Note: Ask the butcher to remove the feather and chine bones so that you can slice the rack easily. Also ask that the rack be "Frenched," which means that all the meat between the rib bones is trimmed for a neat appearance. A thin layer of fat should cover the exterior of the ribs to keep the meat beneath moist as it roasts, but other fat should be trimmed. Halve and core the apples, then cut into 1/2-inch dice. Heat 2 tablespoons oil in a medium, nonreactive saucepan over medium heat. Add onions and garlic, and cook, stirring, until softened, 3 to 4 minutes. Add remaining tablespoon oil to saucepan and stir in apples. Saute, stirring frequently, until apples are translucent and lightly browned, 5 to 6 minutes. Add sugar, mustard, ginger, coriander, cinnamon, and cayenne and stir until sugar starts to melt. Add vinegar and bring to a simmer. Cook, stirring often, until mixture thickens and is syrupy, 10 to 12 minutes. Remove and cool. (Chutney can be prepared 3 days ahead; cover, and refrigerate. Bring to room temperature before using.) Makes 1 1/2 cups.